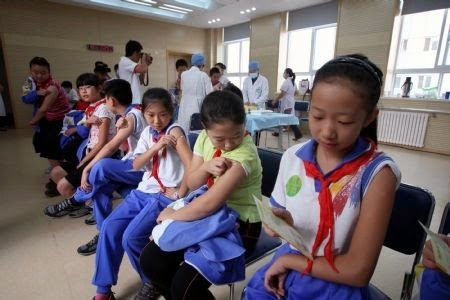 China needs to move from a one-dose to a two-dose varicella vaccination schedule because he current system is not preventing outbreaks of chickenpox, a study from Beijing has shown. from 167 in 2008 to 622 in 2012. More than 60% of the cases were breakthrough infections in children who had been vaccinated, according to Dr Zhang Xue and colleagues at the Department of Epidemiology and Biostatistics, School of Public Health, Capital Medical University. "These results indicated that in the Beijing Fengtai District, one-dose vaccination could not effectively protect the vaccination recipient from varicella infection or cut off the varicella transmission during the outbreak," they wrote. Their study suggested that the efficacy of the varicella vaccine wanes after a few years, and in children with varicella, the average time since vaccination was six years, (76% of cases occurred more than five years after vaccination). Varicella was also more common among children of migrant worker families, presumably because of lower vaccination rates and due to overcrowded living conditions. The researchers said their findings showed that the single dose vaccine program introduced in 1997 was not sufficient to contain varicella in China. "In summary, our study provides justification for implementing a two-dose varicella vaccination program in cities in China, such as Beijing, despite the presence of already-high vaccination coverage."